Give tired eyes the relief they deserve. In this kit you will find three products that will help your eyes get back to their natural glory. No more red eyes, tired eyes or bags under your eyes. This pouch pampers, smooths and soothes while targeting the most common problems of eyes in crisis: puffiness, wrinkles and dark circles. Rx: A trio of their most comforting formulas, curated to work together to target the most chronic symptoms of stress around the eyes. From gentle, nourishing and effortless makeup removal to instant brightening, smoothing and de-puffing, this kit will leave you looking luminous and ready for your close-up. Icelandic Relief Eye Pen-A cutting edge triple acting eye cream in a portable pen, formulated with a breakthrough technology to combat three major eye issues: dark circles, puffiness and wrinkles while on-the-go. 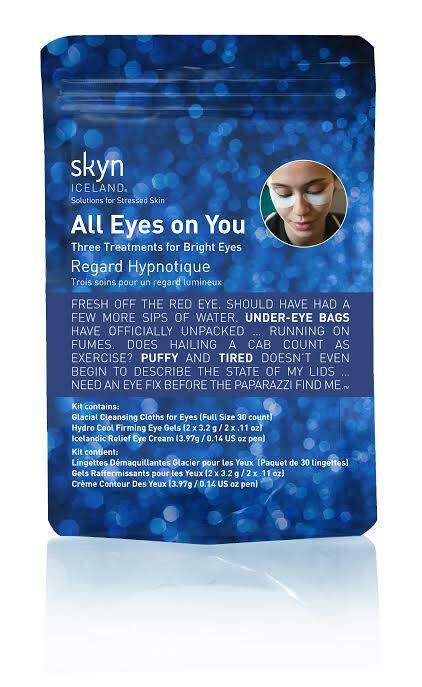 Hydro Cool Firming Eye Gels-Cooling transdermal gel patches infuse the eye area with highly potent actives and Icelandic Glacial water to firm, tone and brighten and reduce the appearance of puffiness and wrinkles in 10 minutes. Glacial Cleansing Cloths For Eyes-Pre-moistened botanically infused cleansing wipes that gently yet effortlessly sweep away waterproof makeup and other impurities without stinging the delicate skin around the eyes. These products feature the Icelandic Complex. The Icelandic Complex is a proprietary natural blend that replenishes the nutrients that stress depletes. Sources from Iceland's natural environment, it contains pollution free Icelandic Glacial Water, with 6 essential minerals to hydrate and detoxify the skin, Arctic Cloudberry and Cranberry Seed Oils "super fruits of the Arctic" rich in omega fatty acids, vitamins and potent anti-oxidants as well as Pure Molecular Oxygen, which delivers energy into skin's deepest layers to bring back a youthful glow. I can tell you this. My eyes have never looked better until I used all of these products together. The stress of the holidays was getting to me, and my dark circles were starting to come back. My eyes were looking puffy from having been sick. So I used the kit. I started off with the Glacial Cleansing Cloths, then used the Hydro Cool firming Eye Gels. Finally I used the Icelandic Relief Eye Pen. What a difference. My eyes looked amazing. I only wish that this kit contained more of the Hydro Cool Firming Eye Gels. I would want to use more of these. But I love the cleansing cloths and the eye pen. 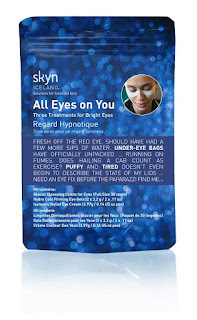 Skyn Icleand Is available online at www.skiniceland.com and at www.ulta.com. Like Skyn Iceland on Facebook: https://www.facebook.com/skyniceland; Follow Skyn Iceland on Twitter: @skyniceland; Follow Skyn Icealnd on Pinterest: https://www.pinterest.com/skyniceland/ and Follow Skyn Iceland on Instagram: https://www.instagram.com/skyniceland/.